addition to our breeding program. and is very flashy and flowing in movement. such as as: VA9 2X VA1(CN) Furbo degli Achei SCHH3, IPO2, and V 1 (SG30 BSZS JKL 2008) Vidol von Babylon SCHH2 . Mack is a big boned male with a big head.....there is nothing small about him. ​and placed well in all of them. He has great drive and temperament and awesome movement. 3X WUSV Rabauke vom Braunschweiger Wappen 16X SchH3, IPO3 and Kkl2. ​tracking used for Search and Rescue. He is a level three protection K9. He stands 26" high and weighs 125 lbs. Kwai is imported from Germany. He comes to us from V Hanni von Dem Waldgraben IPO2, SchH2, Kkl 1. 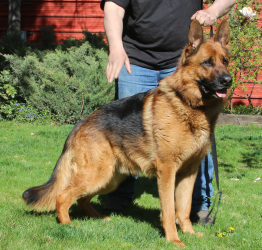 His sire is VA1 Zamp vom Thermodos SchH3, Kkl 1, and VA3 Esko vom Danischen Hof SchH3, Kkl 1. His lines come directly from such champions as 2X VA1 Larus von Batu SchH3, Kkl 1. Kwai has incredible drive and is highly alert. He has flowing conformation and a striking mahogany pigment. Excellent tracking used for Search and Rescue. 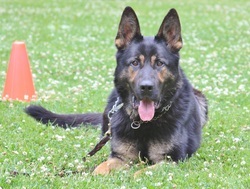 He is a level 3 protection K-9. He stands 26" and weighs 105 lbs. Kwai is OFA certified and DNA profiled.